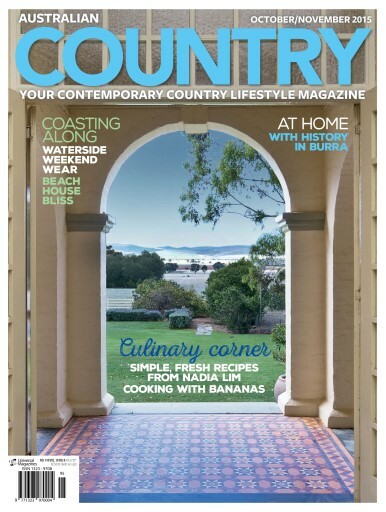 For the next issue of Australian Country we’ve again travelled all over the country to put together a remarkable clutch of stories about some amazing people and places. In South Australia we visit historic Mackerode station and an extraordinary garden created by paraplegic Dennis Roberts in the Adelaide Hills. In Queensland we head north to the Atherton Tableland and a wildlife sanctuary and B&B devised by German-born Margit Cianelli, then to Brisbane where horologist Alan Hazelton gives us a tour of his 500-strong clock collection. The weather is getting warmer so our fashion feature heads waterside and our recipes celebrate the tropical delights of bananas. Our service feature uncovers the infinite riches of accessories for the bedroom and Setting the Scene goes into party mode with loads of inspiration for hosting a Mexican fiesta.